Yeah, so I went missing for a bit there, again. It’s annoying how life gets in the way of important things like personal grooming and blog posting. But, in what’s now become my classic pattern, I return from a hiatus with soup. I’m not sure what it is about a bowl of soup that I have a hard time saying no to. There’s the feeling of warmth and comfort that rises with the steam, and I’m a total sucker for a good savory broth. It’s been odd weather around here recently, with ups and downs and windy bits, and this dinner totally hit the spot for us a few nights ago. It checks all of my weekday meal boxes: it’s damn delicious, healthy to boot, kid-friendly, uses a single pot, and is really quick (as soups go) with minimal human intervention needed. And to add to all of these already convincing reasons, it tasted unusually amazing. Neither of us could put a finger on exactly why, but it just seemed weird that such a simple collection of ingredients could come together to taste so addictive. 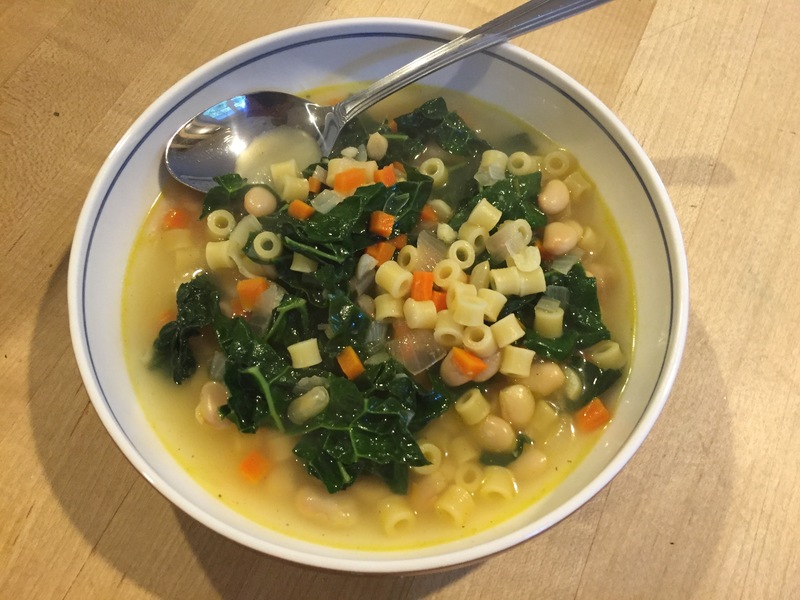 My husband thought it was the parmesan and kale that permeated the broth, I thought it was the lemon and white beans. Try it, and I think you’ll find we’re both right. In a large soup pot, on low-medium heat, fry the onion and garlic in olive oil until translucent. Add the carrot and continue to fry for another minute. Add the vegetable stock, juice from one lemon, and beans and simmer for 5-7 minutes to soften the beans. Add the pasta and parmesan cheese, and continue to simmer until the pasta is al dente, approximately 10 minutes. Add the kale and simmer until tender, and the pasta soft. At this point, you may need to add some boiling water to the soup, as some of the stock may have evaporated (1/2 – 1 cup should be sufficient). Serve with a drizzle of olive oil on top, season with salt and pepper, and grated Parmesan cheese. Note on dried beans: if you have more foresight than I do and care to use dried beans, start with a cup of the dried white beans of your choice. Soak them overnight and drain. Increase the quantity of stock to 8 cups and proceed with the recipe, increasing the simmer time to about 40 minutes after adding in the beans, and before adding the pasta and cheese. I’m a certified cookbook junkie. I love books in general, but cookbooks call out to me. It’s the combination of the glossy pictures, the enticing recipe descriptions, and the sense of a life well lived that pervades them – I want it all. Recently, after admitting to myself that I am truly running out shelf space for any more cookbooks (and no, buying another bookshelf is not really an option), I have come up with a new strategy. I borrow the book from the library (or more accurately, put the book on hold at the library and then wait longingly for weeks, sometimes months, for it to become available), and if I can see at least 20 recipes I’m pretty sure I would make, then I consider buying the book. Otherwise, I just try cooking from them for the next three weeks and then we go our separate ways. It’s an annoying process, but it works. 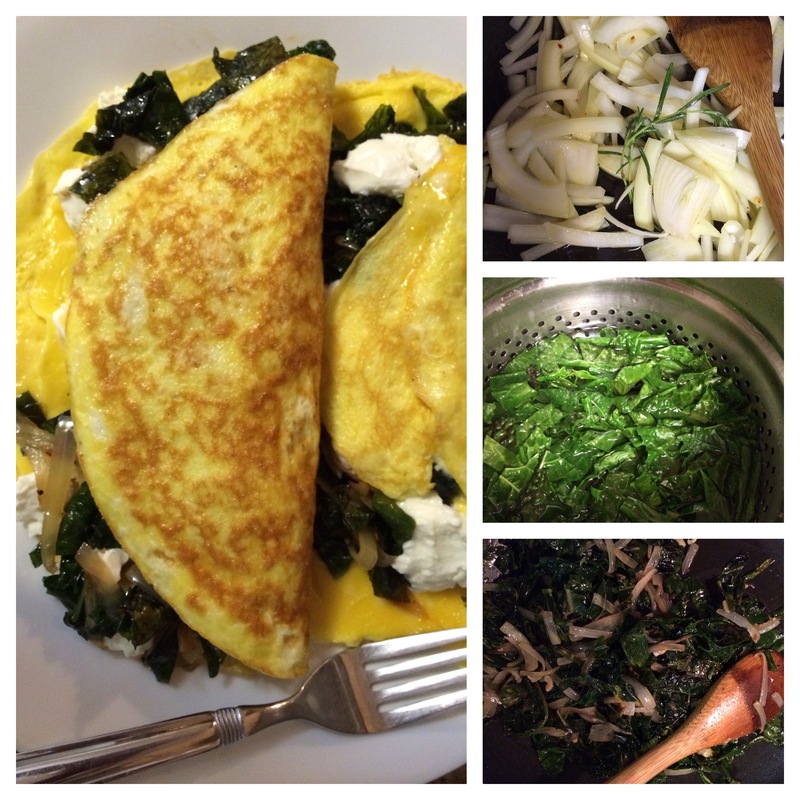 This recipe for kale omelets is from a recent library book, The A.O.C Cookbook by Suzanne Goin. She has an amazing way of describing recipes that makes you want to try them immediately, even if it means dropping everything (even if your tiny human companion is less than thrilled about this), going to the store, and spending a little longer in front of the stove. Her recipes are pretty flawless (ohhh, the hazelnut cake…but that’s for another day) but usually pretty involved. This was a welcome exception. The only part that takes time is slow-cooking the kale. But the flavor develops beautifully, and you won’t regret it. In our house, these are more of a dinner omelet (because breakfast for dinner is one of the best ideas EVER), but this would be equally good at other times of day. Postscript: Ahem. In looking this post over, I realize there are a few too many comments in parentheses. If I were a reader, I would be irritated. So if you are, I understand. Bring a large pot of salted water to a boil. Blanch the kale for 2 minutes, drain, let it cool, and squeeze out excess water. Chop it up and set aside. In a large skillet, warm the olive oil over medium heat. Add the rosemary sprigs and chile and cook for one minute. Reduce the heat to low, add the onion and ½ tsp salt, cook for two minutes, and then add in the garlic slices and stir. Cook for about 8 minutes until the onions are soft and starting to brown. Turn the heat to medium-low, add the kale and oil, stir to coat. Cook for 25-30 minutes, stirring occasionally until the kale is almost black and charred at the edges. Remove the rosemary. Sprinkle some fresh ground pepper, taste for salt, and set aside. Heat a 10” pan over medium-low heat with a small pat of butter at the bottom. For each omelet, beat 2 eggs with a tbsp. of milk. Add the eggs to the pan and let them cook for about a minute and a half. Use a spatula to lift up one corner of the eggs, tilt the pan, and let the liquid egg on top, run underneath. When the top is still soft but the omelet mostly set, put a few spoonfuls of the kale down the center and a generous sprinkle of goat cheese on top. Fold the omelet into thirds and slide it onto a plate. Repeat with remaining omelets.